Did you get lost on internet while looking for information about your unforgettable Costa Brava holiday destination? Take advantage of the rental company of your holiday home! Here, you’ll find a collection of popular and hidden places on the Costa Brava. And something extra: useful information. I bet you can’t wait to discover everything what you can do on the Costa Brava. BUT, I’m warning you! The Costa Brava is more than just a popular party scene! In the crystal clear sea water of the Costa Brava, there are lots of possibilities for water sport lovers. On the mainland of the Costa Brava, it’s full of great cultural landscapes and there are plenty of historical and architectural treasures. The Costa Brava thinks about everyone: there’s an amazing night-life, lots of different types of trips, water parks and many more. There’s always something to celebrate, on the Costa Brava. I’m not talking about a party-hardy with a beat box, but about cultural festivities on the Costa Brava. The most famous festivities on the Costa Brava are: Carnaval (in February/March), Semana Santa (the week before Easter), the spectacular fireworks competition in Blanes (in the middle of July) and, during the summer, the National Festival of Porta Ferrada (one of Catalonia’s most ancient festivals). Make a toast to the cheerful cultural ambiance on the Costa Brava. And, you don’t want to miss anything during your visit on the Costa Brava? Mission possible! Continue reading how to have a perfect holiday on the Costa Brava! No time for detailed information? Check out theTop 10 things to do on the Costa Brava. Luxery villas on the Costa Brava, click here! A profitable day out on the Costa Brava: you get more than what you see! What do you love doing on your holiday? Have fun together with your children at the theme and water parks of the Costa Brava. To some people, the Costa Brava offers an energetic holiday, but to others, it’s a synonym of relax. While you sport, you’ll enjoy the most amazing views of the Costa Brava. Just as in golf courses and other entertainment possibilities, the Costa Brava is very rich in…. the terror of most men…SHOPS! Every village on the Costa Brava has its own shopping street. But the Costa Brava has so much MORE. Relax and rest are easy to get on the Costa Brava. You can have from great massages till inspiring walks on the mountainous areas of the Costa Brava’s inlands. You can’t miss an exploring trip to the most visited coastal villages on the Costa Brava. Or, on the opposite: you should visit the Costa Brava’s picturesque villages and its beautiful nature. To change a bit from the beach or the cultural day trips, try an exciting day out in a theme or water park on the Costa Brava. - Barcelona – There are many shopping centres all around the city. - Espai Gironès – You’ll find it on the motorway exit of Girona and Salt. It has more than 120 shops, a bowling centre, cinemas and a playground. - Centre Comercial Mataró Park – It’s the biggest shopping centre in Mataró and in the whole Costa del Maresme. - La Roca Village – The Costa Brava presents: purchasing luxurious brands with the biggest discounts (on previous collections). - Playa de Aro – Hundreds of shops in one of the biggest open air shopping centres on the Costa Brava. - Monday – Blanes, Cadaqués*, Olot and Torroella de Montgri. *These are the biggest ones. The Costa Brava is a Mecca for sporters. One of the most fascinating coastal areas, on the Costa Brava, is the archipelago of Illes Medes (Islas Medes or Medes Islands), nearby l’Escala. It’s an ideal place to dive, snorkel or take a boat trip. Pals is a magnet for wind surfers. Besides this, just as in other coastal villages on the Costa Brava, you’ll find many other water sports and entertainment activities. Some of these are kayak, water ski, jet ski or/and canoes. Golf is a very popular sport in Spain. On the Costa Brava, you’ll find 10 golf courses and 9 pitch and putt varieties. The favourites are: Golf Catalunya-Caldes (Caldes de Malavella), Glub Golf Costa Brava (Santa Cristina d’Aro) and Golf Club Peralada (Peralada). Mother Nature will reward you with her best views if you have a stroll on the coastal paths (el Camino de Ronda), of the Costa Brava. Or while you have an impressive cycling trip in the inlands, from Olot to Sant Feliu de Guíxols (la Ruta del Carrilet). From the air, the Costa Brava looks magnificent! You’ll sight rock formations, large sandy planes and green hills. Fly on an air balloon, a helicopter or go hang gliding at Empuriabrava. The Costa Brava has 5 sport resorts. During the summer, you’ll find amazing localities to have a walk or try adventurous sports. When the snow season starts, all these resorts are changed into winter sports spots. Some of the coastal villages on the Costa Brava have an unfair bad reputation because of mass tourism and wild night-life. This is just another reason to come to the Costa Brava and discover the truth! The most acclaimed villages are: Blanes, Empuriabrava, l'Estartit, Lloret de Mar, Palamós, Playa de Aro and Roses. The most southern village on the Costa Brava has very beautiful beaches and, nearby the harbour, a unique symbol called “la Palomera”. Because of its two impressive botanical gardens and its old village centre, Blanes is absolutely an added value to the Costa Brava. Empuriabrava is the “Catalan Venice” on the Costa Brava. Many houses are surrounded by channels and there’s, by the way, one of the biggest harbours in the world. L’Estartit is very appealing thanks to its very large sandy beach and the big amount of entertainment spots. In l'Estartit, you’ll also find one of the treasures of the Costa Brava: the amazing diving paradise Illes Medes (Islas Medas or Medas Islands). Party in the great night-life of Lloret de Mar and discover two of the greatest, but still unknown, places of Lloret: Cala Banys and Cala Canyelles. If you think that visiting historical rests is interesting, go to the Roca Grossa and don’t forget to have a walk on the path that goes from Sant Clotilde to Tossa de Mar. Palamós is a calm fishing village famous to fish the best shrimps. The harbour is still very important and has one of the biggest fishing fleets of the Costa Brava. This touristic village has many facilities and is, because of that, prepared to satisfy all your needs. Its beach is waiting for you, just as the cheerful and high quality restaurants, bars and terraces, where you’ll enjoy your well deserved holiday. Roses is the first fishing harbour located on Spain’s north coast. Reasons why you’ll fall in love with Roses: it has an amazingly calm beauty, steep rocks and cheerful small beaches. The Costa Brava’s history is extremely interesting, because of its multiple multicultural treasures. We suggest you to visit the most typical villages of the Costa Brava: from small places like Banyoles, till the artistic village of Cadaqués. You can also visit the city of Dalí, Figueres, the capital of the province, Girona, or villages like la Bisbal, Palafrugell, Peralada, Tossa de Mar, S’Agaró or Ullastret. Banyoles is world famous, though nobody remembers its name and you probably neither. During the Olympic Games of 1992, Banyoles was on the spotlight during the rowing competition, which was celebrated on its lake. Banyoles is surrounded by a beautiful landscape of fields and small hamlets. Or, in other words, it’s the ideal departure point to have a walk or a cycling trip. Cadaqués is a picturesque village where many artists and intellectuals live. You’ll find art galleries everywhere and you’ll enjoy from quirky cube-shaped houses, like Dalí’s former house, till churches with amazing details in baroque style. The main street, called la Rambla, will convince you with is breath-taking neoclassical and modernistic buildings. The greatest building of all is the Teatro-Museo Dalí, with many art works and paintings from the one and only Salvador Dalí. The Cathedral of Girona is the highest building of the old centre, the Barri Vell. If you go there, you’ll be surrounded by medieval walls and Roman gothic and baroque style buildings. Besides all this, and just like in Besalú, there’s also the possibility of visiting the Jewish quarter, el Call Jeu. The most impressive results of the Jewish culture are the Banys Àrabs, from the 12th century. La Bisbal is famous because of its ceramic’s production, its shops and its workshops on the main street. The former fishers’ neighbourhoods don’t exist anymore and have become touristic areas. But there are still many places to relax: have a quick walk from Calella de Palafrugell, passing Llafranc and ending at Tamariu or visit the nearest village called “Pla”. There, you’ll find a museum dedicated to the cork industry (in the middle of the village centre). Peralada is a small medieval village with an impressive castle, el Castillo de Peralada. The castle used to produce wine on the underground and in its cellars. And for the adventurous fortune seekers there is the "Casino Castillo Peralada'. Tossa de Mar is a medieval village with a fortress and a maze of small alleys. You’ll find there many walking routes that will lead you to historical buildings and museums, like the Casa Flaguera, at the beginning of Vila Vella (the old defence towers and walls). The Costa Brava’s jet set goes to S’Agaró. It’s a luxurious area to see and to be seen. Ullastret was the most important Iberian settlement of the Costa Brava. These ruins are relevant because of its big dimensions and its well preservation (people lived there from the 6th till the 2nd century B.C.). The Costa Brava has rocky coasts, long beaches and green inlands, which reach till the Pyrenees. The relatively simple sea-bottom is filled with beautiful coral and an impressive nature reservecalled les Illes Medes (Islas Medas or Medes Islands). The breath-taking nature of the Costa Brava is enormous. The Cap de Creus, the Parc Natural dels Aiguamolls de l’Empordà and the botanical gardens, in which the Costa Brava is very rich at, certainly add more value to it. The highest point of the Costa Brava is at the Parc Natural del Cap de Creus. It’s also the place of residence of many types of birds. While you have a walk or enjoy a sensational sunset there, you’ll feel the peaceful atmosphere of the Costa Brava. The partially protected nature reserve “els Aiguamolls de l’Empordà” has fascinating walking routes. If you want to watch birds, the best moment of the year is autumn or spring. You will, with no doubt, find one of the 323 types of birds on the Costa Brava. In front of l'Escala’s coast, you’ll find the Medes Islands. From there, you can dive or snorkel or admire the Costa Brava’s biggest submarine treasures from a glass bottom boat. Allow your senses to be lifted while you observe the beauty of la Meda Gran; or head for the southern islands Carall Bernat and Gran. The Costa Brava has beautifully designed botanical gardens. Some examples of botanical gardens are: el Jardí Botànic de Cap Roig (in Calella de Palafrugell), Pinya de Rosa (in Blanes), Santa Clotilde (in Lloret de Mar), Marimurtra (in Blanes) and the Jardins de la Francesca (Girona). But don’t forget the historical/cultural heritages. In the inlands of the Costa Brava, there are many more than you expect. High lights on the Costa Brava which you shouldn’t miss are: the archaeological ruins of Empúries, the Roman monastery, the medieval villages Pals and Peratallada and the wine area of Empordà. In Sant Perde Rodes, you can visit one of the most important Romanic buildings of Spain, the monastery Sant Pere de Rodes, with its beautiful views. The Cap de Creus and the French border are not far away from this monastery. Are you coming in July/August to the Costa Brava? Then, you’ll be part of the yearly musical event in the monastery (classical music concerts). Pals is a traditional medieval village, where you can still see the defence walls. You’re going to feel like in the Medieval times because of the many medieval buildings. Together with the graceful fountains, cheerful squares and architectural details on the facades, you’ll feel like in a fairy tale. The cheerful old village of Peratallada is known because of its old stone buildings and the maze of stone streets and alleys. Inside the old village, you’ll discover many hidden restaurants, small boutiques and artist’s houses. Outside the three parts of the thick defence walls, you’ll find the Romanic church of the 13th century. The wine region Empordà is responsible of a sparkling quality wine production and diverse wine cellars. How do they make this wine? Castillo Perelada will show you their cellar and garden, while the wine museum shows you the wine’s history. Get to know everything about the Costa Brava without reading 10 touristic guides. Luckily, the people from the travel agency will tell you all the information you need and the latest news. In most of the holiday destinations on the Costa Brava, you’ll find local travel agencies, which organize different kind of trips in the area. Our suggestion is to take the guided trips to Barcelona, Montserrat and Cremallera, the village tour of Rupit, el Far and Besalú and the world of Dalí. Do you want to experience the most exciting roller coasters, nonstop water fun and high quality entertainment? Go to the amusement park (inclusive water park): Port Aventura! If you want more action, you can try diving or having a jeep or quad safari. On a hot day, you’ll probably prefer something refreshing, so you can also enjoy a fresh breeze on the Catamaran Cruise or on a boat trip. The evenings on the Costa Brava aren’t boring at all! There are many restaurants and bars but, if you want some variation, the Costa Brava has something special for you: get into the Costa Brava’s atmosphere in a flamenco show or in a medieval evening. You’re already on a holiday in a foreign country. But, what can be better than visiting 2 countries during your holiday on the Costa Brava? From the Costa Brava, you can easily drive into the amazing inlands. You’ll see beautiful green hills, old lava ruins and, every now and then, a typical house. With the Pyrenees on your right side, you’ll arrive at the mini country Andorra. Andorra is an amazing ski resort, which is very famous because of its tax-free shops. If you like to shop, the main street is the ideal place for you! And, besides all the shops, you can also have an amazing photo safari, with the most beautiful surroundings. Barcelona Aquarium – Come to the Aquarium to have a unique experience and discover the Mediterranean undersea world. Wander between all types of fish and water animals and cross the 80 metres long glass tunnel. It’s a breath-taking experience. One thing is for sure, you won’t get bored in the Barcelona’s Aquarium, there are 35 big aquariums divided into 6 different themes. Barcelona Camp Nou Experience – Take an exceptional tour around the FC Barcelona football stadium. You’ll also visit the museum, where there are the most famous cups and the shoes of Johan Cruijf, the changing-room and the duck out. Barcelona Experience – While you have a tour around Barcelona’s high lights, you’ll get to know the newest trends and historical details. Barcelona by Night – For those who love the night, there’s a midday-evening excursion to Barcelona. At noon, you’ll have the panoramic tour of Barcelona and, in the end of the trip, you’ll visit the bottom of the mountain Montjuïc. During the breath-taking fountain show, many colourful fountains will dance cheerfully at the rhythms of classical music. Barcelona Zoo – Do you want to see tigers and lions, without going on a jeep safari? Come to Barcelona’s Zoo. This zoo is unique because of the great variety of animal species (more than 450!). You’ll see from felids, reptiles and different types of monkeys till dolphins! And on top of it, there’s also entertainment for kids. One of the most visited museums in Spain, is the Theatre – Museum Dalí (in Figueres). You won’t get tired of gazing the striking building, with Dali’s master pieces on the floor, the walls, on the ceiling and in unexpected places in the garden. Dali’s former house is located in Port Lligat (Cadaqués). It’s where Dalí got inspiration for many of his works. If you reserve, you can have a tour inside the house. And, besides that, Port Lligat is also a lovely place for nature lovers and art fanatics. Casa – Museo Castell Gala Dalí (Puból) is wonderful. Wander through the castle and enjoy the paintings and other art works; just as the world famous elephant sculptures in the fascinating garden. The religious historical village of Monsterrat is the spiritual centre of Catalunya. This more than 1.000 years old Benedictian monastery yearly attract many visitors. Its boys choir performs daily around 13 o’clock (except on school holidays). The most exciting piece of art in there is the Black Madonna “La Moreneta”, which is named just as the stone sculpture from the holy Virgin Maria, in the monastery “Santuario de Lluc” in Mallorca. The village is situated in the Montserrat National Nature Park and that’s why it’s ideal to have a walk. Entertainment parks are for young and less young. The park is composed by different thematic areas, with roller coasters, water coasters and many more. There’s also been thought about young kids; there’s nothing more annoying that being told that you’re too young to go on an attraction! That’s why Port Aventura, has made a special area just for the youngest between us! And, in Port Aventura, there are many places to eat or have a drink, so, don’t worry, you won’t die of the thirst or hunger. Singing, guitar and passional flamenco are the symbols of Spain. Full of emotions, the flamenco is a way in which feelings get free: from sadness to happiness. Enjoy all this beauty while you have a delicious dinner or an appetizer with snacks. The medieval evening is par excellence a top Burgundian evening! Young and old will enjoy the magnificence and the splendour. The duke and duchess will welcome you, together with the beautiful maids that will serve your food, while the knights and their loyal horses take care of the medieval amusement. The evening will be completed by the whirling of the flamenco dancers and musicians on the stage. Do you want an all-inclusive day out on the Costa Brava’s coast? You’ll sail with a party boat to a secret location. Once you arrive on the deserted beach, it will be PARTY TIME! Float on the sea with the flyfish or fly on the waves on a speed boat. Everything is possible! Of course, the animation team will also organize blistering games. And to make the atmosphere even better, you’ll listen to the hottest summer tunes while you eat and drink whatever you want. Departure points: Lloret de Mar, Blanes, Malgrat de Mar, Santa Susanna and Calella. Chill out and relax on the Costa Brava on a catamaran. The crew will take care that you have fun and enjoy the sun and the sea. Once you’re on the water, fun starts. During the cruise, the catamaran will stop so you can snorkel, jump out of the boat or just idle on one of the rubber rings. The Costa Brava is not a jungle, so you won’t see lions, tigers or elephants. Boooring? Nope, you’ll experience many exciting moments on the Costa Brava. During an adventurous jeep safari, you’ll penetrate the virginal inlands of the Costa Brava. In just a half day, or whole day, you’ll discover a new side of the Costa Brava. Do you want an extra adrenaline shot? Drive the jeep yourself!Of course, this will depend on several aspects like the amount of years that you’ve had your driving license, your driving skills, the number of persons on the jeep, etc. Don’t forget to take your driving license with you! After a day out in Barcelona or a breath-taking cycling tour through the inlands, you’ll probably desire an ordinary beach moment. The Costa Brava has many beaches where you can picnic, have a beach volleyball game or simply get tanned on a sun lounger. The beaches have fine sand or fine course sand. In most of them, you’ll also find an information board, in which you’ll see that, for example, dogs are not allowed to go on the beach. If you want to walk with your dog on the promenades and boulevards, it’s possible if you hold it with a leash. - Aiguablava (Begur) – Costa Brava’s romantic beach with some fish restaurants. Blanes – 625 metres long beach with all kinds of services. Cala San Francesc – It’s a romantic bay situated between Lloret de Mar and Blanes. - Cadaqués – It’s a coastal area composed by many beaches and bays. You’ll also find a small bay reserved only for nudists. - Calella de Palafrugell – It’s one of the most romantic beaches on the Costa Brava. It’s divided into three smaller beaches: Can Calau (60 metres), Port Bo (55 metres) and Port Malespina (50 metres). - Castell (nearby Palamós) – It’s one of the only beaches on the Costa Brava that’s not touristic at all. Lloret de Mar – It’s a 1.300 metres long beach with coarse sand. During the summer period, it has all the main services, inclusive a mini club for the kids. Cala Canyelles – It’s a 400 metres long beach with SOS, parking, water sport facilities, restaurants and a harbour. Fenals – It’s a 775 metres long beach with many restaurants, bars and parking. - Playa l'Amadrava (Roses) – It’s a small beach with a parking, restaurants, bars and it’s also accessible for disabled people. - Mas Pinell (Toroella de Montgri) – It’s a 3.100 m long beach, which is ideal for (wind) surfers. Cala Codolar – It’s a 90 metres long beach with bus service, parking and showers. Cala Giverola – It’s a 175 metres long calm beach where you can hire sun loungers and parasols. Mar Menuda – It’s a 180 metres long beach with an SOS post, parking, bars, restaurants and it’s also accessible for disabled people. Everywhere in Spain, so also in the Costa Brava, restaurants and bars offer typical Spanish dishes. Think about the refreshing 'gazpacho' on a hot summer day. This type of food is like a cold tomato soup, but it looks much tastier than what you are probably imagining! You can have as many types of tapas as you want. Or you can make a combination of these small snacks, like 'calamares' (fried squid rings), 'gambas' (prawns), with 'pan con tomate y ajo' (bread with tomato and garlic) and cheese chunks. And who doesn’t know the famous 'paella': a rice dish with fish, vegetables and, sometimes, meat. The preparation of this delicious meal (if you like rice) is more complicated than its description. When making paella, the pan (also called paella) is very important. Now that you’re on the Costa Brava, you’ll probably want to experience something from this coastal area. The Costa Brava’s kitchen knows many fish and seafood meals. For people who love meat, a stay on the Costa Brava is also great because the most popular meal is a pork sausage. Of course, there’s also chicken and other types of meat. Sweets, sweets and… more sweets. In the category desserts, the 'crema catalana' is our best suggestion. The real traditional gastronomy is located in the inlands and in the smaller fishing villages. Nevertheless, the bigger coastal towns also try their best to show you from international meals till very national ones. The most famous night-life resort on the Costa Brava is Lloret de Mar. If you want fun and entertainment, you can visit the Gran Casino Costa Brava. Besides, you’ll also find more than 100 pubs, big and famous clubs and disco pubs, which, in the summer, will make you party the 24 hours of a day. Just 5 kilometres to the south of Lloret de Mar, you’ll find the last village on the Costa Brava: Blanes. It’s a peaceful village that’s very loved by families. But you should know that also in Blanes there’s a very exciting night-life! Playa de Aro also joins the team of partying villages of the Costa Brava. But just as Blanes, Playa de Aro is an amazing village for young people and families (with kids) to have a great holiday evening. To those who like to gamble with style, there are 2 casinos on the Costa Brava. In Lloret de Mar, there’s the Gran Casino Costa Brava, which is located in a very modern designed building. And, in the opposite direction, in the north of the Costa Brava, you’ll find the Casino Castell de Peralada. In this place, you’ll be surrounded by amazingly beautiful designed gardens. While you spend your evening on the roulette table or in another gamble section, there’s a beautiful evening oncoming in the beautiful castle of the 14th century. What do you know about the Costa Brava’s location? It’s not that important, but it’s a bit sad if you don’t know where you’re going on a holiday. That’s why we’ve got this short IQ-moment. 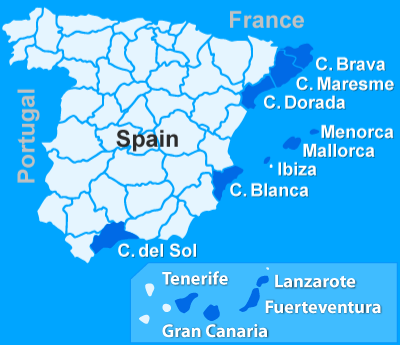 The Costa Brava is the first coast on the Western north coast of Spain. It’s located from Port Bou till (and including) Blanes. Besides this, it’s situated in the province of Girona, which is a part of Catalunya (one of the 17 autonomic regions of Spain). Every part of the Costa Brava has its own specialty. The different areas are divided into the so-called comarcas (region): la Selva, el Baix Empordà, l’Alt Empordà, el Pla de l’Estany and el Gironès. These, where discovered in the 20th century by many important artists and are, nowadays, the 2nd residence of the rich people from Barcelona. The Costa Brava is very privileged with its very nice mild Mediterranean climate. This free service will give you warm summers with an average temperature of 28 degrees. Every now and then, it rains; though this is more likely to happen in April or May. Are you coming to the Costa Brava sometime between October and April? Then you’re coming to a soft winter area. The average minimal temperature is just 3 degrees, in exchange for the average maximum temperatures, which is 21 ºC. The Costa Brava sounds better than what you thought, eh? Sometimes the Tramuntana wind blows on the Costa Brava. The bad news is that this kind of wind is really cold. But don’t worry, because while there’s Tramuntana the Costa Brava sky looks more blue than ever and, after the wind, comes the good weather! In terms of transport, the Costa Brava won’t disappoint you. Some roads are not that perfect, but the Barcelona and Girona airports are very well connected to the Costa Brava. We recommend you to use a (hired) car. What do you need to hire a car? A valid ID, driving licence and money, of course. Many times, a deposit by credit card is asked before hiring the car. Don’t forget to get a car insurance! Parking in Spain can sometimes be a bit complicated; for example, you can hit someone’s bumpers! Buses and trains are relatively cheap public transport. The connections between the coastal villages are quite good. For those who like challenges, you’ll find the links of the bus companies’ websites, like Pujol or Sarfa, really useful. You can also keep it easy. In each bus station, you’ll find a touristic information office (Oficina de Turismo), where you can get informed about the actual time schedules of the concerning region. To and from Blanes, Figueres, Girona, Llançà and Portbou, you can travel by train to, for example, the most visited city in Spain: Barcelona. You can find the actual time schedules and more useful information at the train stations, the touristic information point (Oficina de Turismo) and on the website of Renfe. Taking a taxi can be really comfortable for short distances to the centre or when, late at night, you want to go back to you holiday home. Taxis are quite cheap. Keep in mind that it’s a bit more expensive during the evening/night, during the weekends or when you’re travelling with suitcases. Do you want to travel with complete freedom to unknown places on the Costa Brava? Scooters and motorbikes are great ways of transport. It’s also the best way to avoid traffic jams! It’s not compulsory to wear motorbike clothing, but we recommend you to take care of your own protection; besides the helmet, casco, which is obligatory. Just as when hiring a car, to hire a motorbike or scooter, it also requires an ID and driving licence. And be sure that you’ve got all the necessary insurances! Sometimes, they take your ID as a deposit to hire the motorbike; it’s your own decision to accept this or not. Generally, there’s no problem in paying by credit card. BUT, don’t forget your pin code, because it’s regularly asked, just as your Identification Document! We recommend you to always have some cash with you. In most of the villages on the Costa Brava, you’ll find many cash machines and, in bigger towns, you’ll also find offices, where you can get cash from Monday till Friday from 08:30 till 14:00. Some banks are also open on Thursday afternoon from 16:30 till 19:15. Some banks have cash machines inside their office. This is the safest way to withdraw money, because the counter of the bank is locked. How many times a day can you withdraw money from a cash machine? Of course, this depends of how much money you have on your bank account. Hahaha. Besides this, every bank card has its own rights, which depend on which option you took in your bank and it also depends on the bank you chose to withdraw money on the Costa Brava. The maximum amount of cash allowed to take is usually between the 1.200 € and the 1.500 € a day. But this doesn’t mean that you can’t spend this amount while shopping! - What happens if you lose your bank card or it gets stolen? Did the cash machine not return your card? Contact the bank or if the cash machine is outside the bank and it’s open, go inside the office. Have you been robbed? Don’t take any risks and call immediately your bank to block your card. Later on, go to the police station to ask a theft report. Don’t forget to take your identity card or any valid identification document with you to report to the police. How can you get money? With Internet banking, you can transfer money to one of your relatives or friends’ accounts, so you can still use your own money. If this is not possible, the bank can inform you about other possibilities. Economical crisis or not, a tip is still considered something polite. When you give a good service to someone, you surely appreciate an extra 5 or 10%. And so does the attendance! Tap water is safe on the Costa Brava. Nevertheless, it tastes a bit to chlorine, and it can affect your intestines. To prevent is better than to cure during your holiday, so drink bottled water, which you’ll find in supermarkets, petrol stations and in many other places. For first aids medical help you can go to a medical centre. The biggest villages have doctors and medical centres. The drugstore is indicated by a red plus surrounded by green. The number is for declaration of eg burglary, theft and loss of documents / property. Languages: German, English, French, Italian and Spanish. - How can you call to the Costa Brava? 1. Ensure that the (mobile) phone number that you want to call has a region number. 2. Put the Spanish land code (0034 or +34) before the (mobile) phone number. 3. And you’re ready to call! 1. Be sure of the country or region cod is included. 2. Put the telephonic prefix of that country before the (mobile) phone number. If the (mobile) phon number starts with a '0' take the '0' out. Be aware the phone number in this example starts with a '0' and is taken out when you call from abroad!! So, are you ready to have fun in a relaxing summer holiday on the Costa Brava? The Costa Brava has very good connections, so stop by... by car, bus, train or plane! It’s just great to enjoy your holiday in your own holiday home for a reasonable price. Choose between more than 600 holiday homes. Most of the villas have their own swimming pool! Fancy 8-person Spanish holiday villa with a private pool, garden, terraces and a balcony. Inside you will find 4 bedrooms, 4 bathrooms, one of which with whirlpool, a living room, open kitchen, all along the delightful Mediterranean Costa Brava.